Komyo-ji Temple in Nagaokakyo-city was first built in 1198 by Kumagai Naozane who is a disciple of the Buddhist Master Honen. The Temple is also the head temple of Seizan Pure Land Buddhism. In the temple’s grounds, there are the massive Main Hall which was built in 1754 of the latter half of Edo period, Amida-do hall which enshrines a statue of the Amida Nyorai, Kannon-do hall, enshrines a statue of the eleven-faced one thousand-armed Kannon Bosatsu and some other buildings. 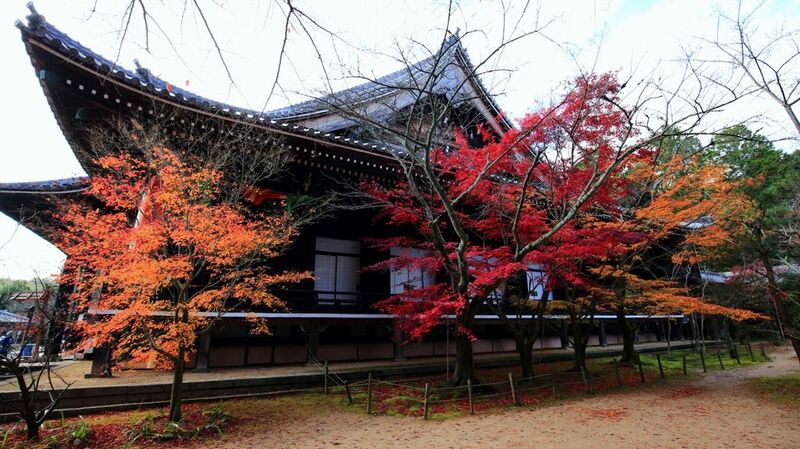 Komyo-ji Temple is known as “Momiji Temple”, an autumn leaf temple. In the end of November to December, The Temple is covered by autumn leaves, and both sides of the approach, “Momiji Sando” are filled with brilliant red maple trees. A beautiful red color is stunning. The fallen red leaves make a beautiful red carpet. Visitors can see an awsome picturesque scenery. Visitors can also see a view of typical Japanese garden and Japanese style images. Access : Take Hankyu Bus No 20 or 22 from Nagaokakyo station on the JR Kyoto line or Nagaoka Tenjin station on the Hankyu Kyoto line to Asahigaoka Home Mae.